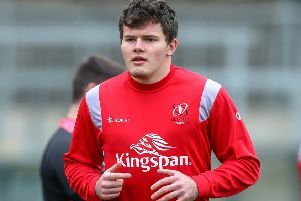 As a club who want to challenge in Europe it is important to keep strengthening the side insists Ulster’s Alan O’Connor. Ulster confirmed the signing of Australian Sam Carter two weeks ago and it was also revealed last week that South African Irish qualified prop, Gareth Milsanovich would be joining the Irish Province over the summer. Obviously Carter will provide further competition in O’Connor’s second row department, but that is something he looks positively on. “He’s (Carter) got great experience, he’s a good lineout operator and he’s good around the field. “He’s a good all-rounder so I’m really looking forward to playing with him and see what he offers to the team. In terms of competition for places, O’Connor admits that no one likes to be taking a break from playing. “But if you want to be one of the top clubs in Europe, and we’re down to the quarter-finals now, and you want to keep going that way, you have to keep strengthening the squad. A draw with Benetton in their last home game two weeks ago left them in fifth place as well as missing out on an opportunity to regain second spot. “We didn’t want to be drawing obviously and we were lucky enough not to lose that,” said O’Connor. “Leaving that fester in your mind for two weeks is long enough so I think everyone is looking forward to righting that wrong and producing a performance that is worthy of the Ulster jersey.